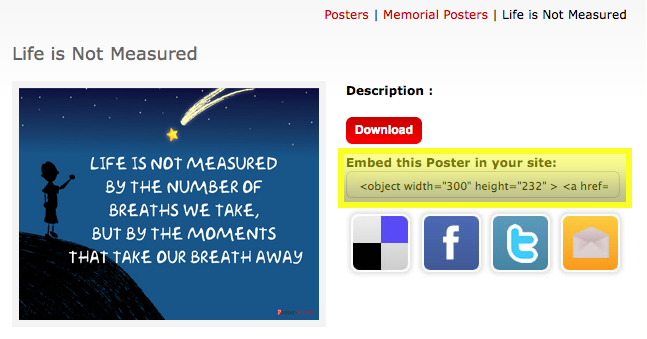 Entries tagged with “embed images”. I’m so excited to announce this feature I can hardly contain myself! On Friday, I received an email from Nelba from Argentina, asking if it would be possible to create a way to embed our free posters in blogs or websites (just like you embed YouTube videos). We thought this was a great idea and our very talented programmer got to work right away. I’m thrilled to report that early this morning, this new feature was rolled out for everyone to enjoy. 1. Find the poster you’d like to embed. 2. Copy the little piece of code to the right of the image (see image above) by right clicking and selecting copy or using a keyboard short cut (CTRL + C). We’ll add a copy button soon. 3. Paste the code into your blog post. In Blogger click on the EDIT HTML tab, in WordPress just click on the HTML tab. Let us know what you think and once again, thank you, Nelba for this great idea!